Most Americans believe that in our lifetimes science will put a robot in every workplace (62 percent) and cure cancer (55 percent). And while most don't regret not pursuing science careers, almost all would like their kids to know more about science and even pursue a job in a science field. Those are a few of the broad findings in a new global survey undertaken by 3M to understand the "state of science" in the world. The science company commissioned consultancy Ipsos to conduct online and offline interviews with about 1,000 people aged 18 and older in each of 14 countries — both developed and emerging — during summer 2017. Besides the United States, the countries included Canada, France, Germany, Japan, Singapore and the United Kingdom in the "developed" group; and Brazil, China, India, Mexico, Poland, Kingdom of Saudi Arabia and South Africa in the "emerging" group. When asked what two fields respondents would choose as a career today, science showed up near the bottom of the stack, behind business, IT, education and medicine, among other fields. Yet 96 percent of Americans said they'd like their children to know more about science (vs. 92 percent globally); and 89 percent would like their kids to get into a science career (vs. 82 percent globally). Other U.S.-specific results included the following. More than nine in 10 respondents (93 percent) consider the world a better place because of science. 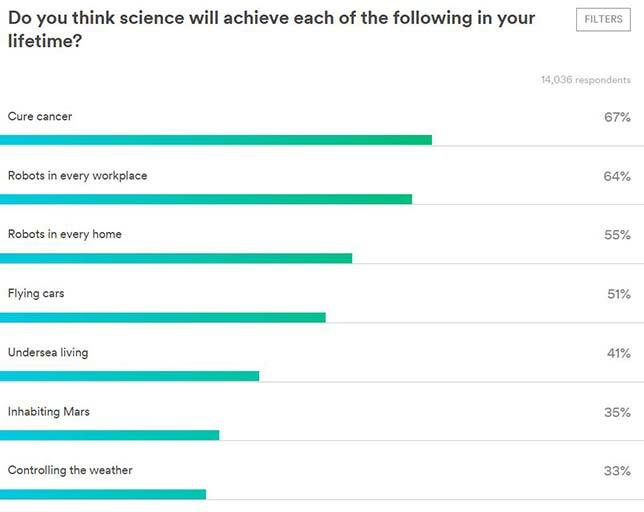 Almost eight in 10 (79 percent) consider the best days of science still to come. And two-thirds (67 percent) are excited about the impact of science on society in the future. On a "science trust index" scale, which quantifies the perceptions of trust people have toward science, Americans tend to trust science slightly more than the global response (57.3 percent vs. 56.1 percent). India was the top-ranked country on the science trust index (67.2 percent), and Japan was at the bottom (49.1 percent). Yet, only 30 percent of U.S. people said they "completely agree" with the statement "I trust science," and just 21 percent said the same about the statement "I trust scientists." Even fewer (20 percent) absolutely agreed with the statement "I believe in scientific claims." Those who considered themselves to be "science skeptics" are far more likely to hold negative views of science than non-skeptics. For example, while half of skeptics said technological advancements were more important than scientific advancements, just 23 percent of non-skeptics said the same. While 40 percent of skeptics reported that their everyday lives wouldn't be "all that different" if science didn't exist, just 16 percent of non-skeptics answered similarly. And among skeptics, 36 percent stated that they saw no need to understand science, just 10 percent of non-skeptics gave the same answer. Alarmingly, the researchers found that Americans take science for granted in their daily lives. While 69 percent said that science was "very important" to society in general, just 49 percent said the same regarding the relevance of science to their family in their everyday lives. This response varied by gender; while 53 percent of men reported that it was very important, just 46 percent of women did so. Two in five respondents (41 percent) specified that science causes just as many problems as solutions; and one in five (22 percent) agreed that if science didn't exist, neither everyday life nor society would be very different from what it is now. Americans tended to view the impact of science as being stronger for "large-scale, macro issues," over "social, micro issues." While 79 percent said science could find solutions for the global problems related to clean water supplies and sanitation, just 43 percent said it could contribute to addressing healthcare costs. And while 78 percent said science could tackle energy supply problems for the world, 41 percent said it could address border security. Most U.S. citizens (60 percent) would like to see their government contribute more to funding science research; that count jumped to 67 percent among those 18 to 34 years old. 3M's conclusion after doing the study: Science needs a champion. "3M wants the 'State of Science Index' to provoke a national conversation about science," the company said in a presentation of the results. "We think there's an opportunity to inspire people to be more conscious of the science around them, to connect the dots between science and the impact it has on their everyday life." To that end, 3M recently appointed Jayshree Seth as the "first ever" 3M chief science advocate. Seth will serve as an ambassador to spark dialogues on the image of science and the importance it plays in improving lives around the world. She holds a Ph.D. in chemical engineering, and 59 patents bear her name. The results of the survey are being shared on the 3M website.